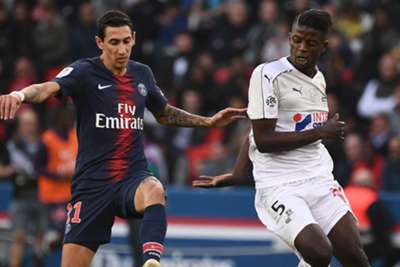 Thomas Tuchel expects to have Paris Saint-Germain pair Marco Verratti and Angel Di Maria available for Wednesday's Champions League tie with Napoli, despite both coming off in the 5-0 win over Amiens. PSG's winning streak to start the 2018-19 Ligue 1 campaign was stretched to 10 games with another comfortable victory on Saturday, with Marquinhos and Adrien Rabiot heading in from first-half corners before Julian Draxler, Kylian Mbappe and substitute Moussa Diaby all scored in the final 10 minutes. "[Verratti] felt a muscle discomfort," Tuchel explained at his news conference. "Like Angel Di Maria. But I think they can play against Napoli. Same for Thiago Silva, who also felt muscle discomfort at the end of training [on Friday]. It was too risky to play this afternoon." "It was not a great performance on our part, but we were serious and provided a great collective effort," Tuchel added. "We deserved to win, even if the score seems a little too high." PSG's all-time top scorer sliced a glaring opportunity wide in the first period and Tuchel admitted he had kept the striker on the pitch so he could try and get among the goals. "It's normal that a real number nine like him is sad when he has not scored," Tuchel said. "Maybe it was better to take him out after an hour of play but I left him on the field because I was hoping he would score a goal. That was not the case but he can score against Napoli."